Don't have Valentine's Day Plans Yet? Now you Do! I pulled this post from The Invitation Lady's Blog. Just had to share! Plus Inspirador is an amazing venue and they have such great events there. To all those guys that haven't made Valentine's Day plans...this one is for you. OR, grab a group of girlfriends and celebrate your friendship together. It's going to be great. See you there! Please review the exquisite event that Inspirador is hosting this Valentines Day. Read below for more information on Chocolate Amnesia. 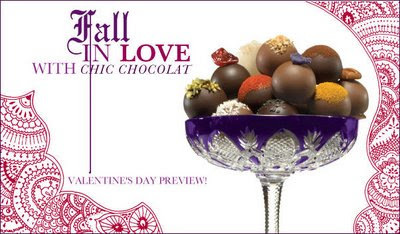 Tantalize your senses this Valentine’s Day with a fusion of CHOCOLATE, WINE, and ART! This Valentine’s Day join us for an evening of contemporary ART, fine WINE, luxury CHOCOLATES and good company all in hip and historic Downtown Chandler. Stroll the colonnades after your taste experience and enjoy shops, galleries, and BEST OF restuarants. Indulge in a culinary tour of spices through flights of chocolate and wine that will tease your palate and peak new interests. Explore 7 PERFECT PAIRINGS like organic peanut butter bon bons dusted with fleur de sel paired with a buttery white winter port.Mingle amongst contemporary artwork in an urban chic Manhattan setting and fall in love all over again!